About two weeks ago, I made a brief comparison between a McDonald’s Value Menu double cheeseburger and a homemade cheeseburger, concluding that the homemade one was price competitive. This brought out a ton of commentary from people standing up for the double cheeseburger (as well as fast food critics) questioning the conclusion. After reading through all these comments, I decided there was only one thing to do: do the thing right. So I headed to McDonalds. While there, I bought a single double cheeseburger for $1.06 after tax. I had to wait for a bit to get the double cheeseburger, as there were three people in line in front of me. 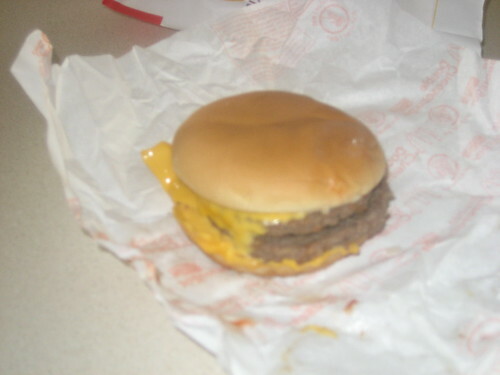 From the time I stepped out of my vehicle and I got back into my vehicle, I spent eleven minutes at McDonald’s. I don’t really need to go on from there – from a health perspective, it’s definitely worth being concerned about. I did note the serving size – the single cheeseburger is 4 ounces, while the double cheeseburger is 5.8 ounces. That means a beef patty at McDonald’s has a weight of 1.8 ounces and a double cheeseburger has 3.6 ounces of meat. In other words, you can make just about five patties at home out of one pound of beef – each of these patties would have the same amount of beef as a McDonalds’ double cheeseburger. 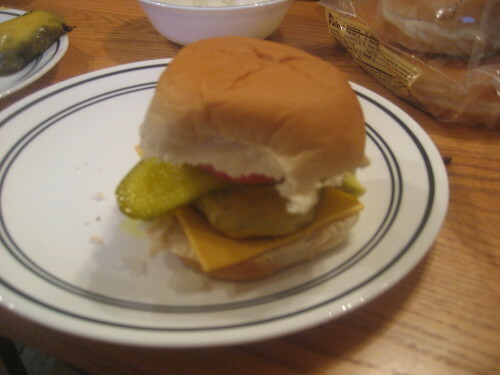 I spy two slices of cheese, ketchup, diced onions, and some slices of pickles. 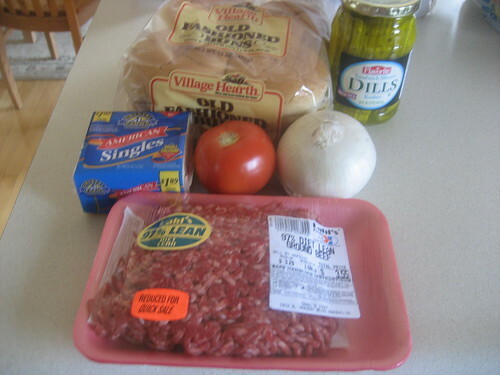 So, in order to construct a similar burger at home, I need hamburger meat, buns, cheese, ketchup, onions, and pickles. A confession: I can’t stand ketchup. I like homemade ketchup alright (basically tomatoes boiled down into a thick paste with some vinegar and a bit of spicing), but the store stuff, with high fructose corn syrup as the third ingredient, makes my stomach turn. 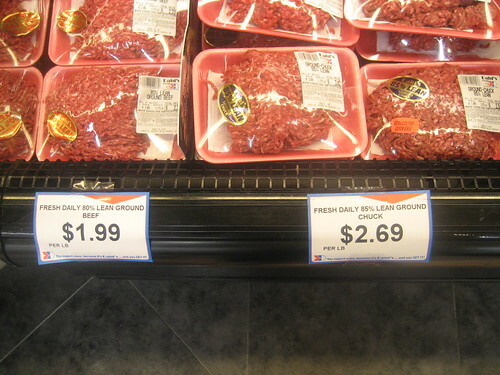 So, even though it will increase the cost for my own burgers in this price comparison, I’m going to substitute a slice of fresh tomato for that ketchup. Off to the store. I bought these items as part of a regular shopping excursion, so the time for buying these items was maybe two minutes. I went shopping at a Dahl’s grocery store. 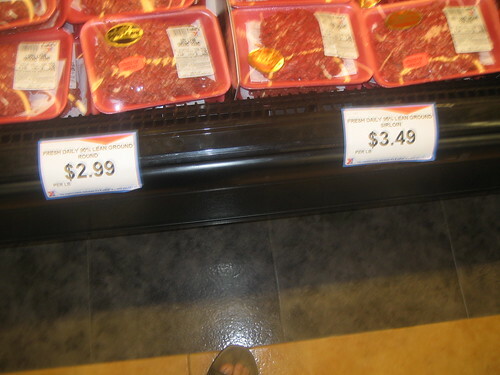 The cheapest option was 80/20 meat at $1.99 a pound. 80/20 means that the meat consists of 20% fat. Since that was the cheapest option, I went for that one, though I would normally tend to spend more and get a pound of the 97/3 meat, which is far healthier. Here’s the nutrition facts on the 80/20 meat I bought, per one fifth of a pound (I did the conversion from the one ounce numbers), if I were to broil it. I’m actually intending to grill it, which is far healthier as it allows much of the fat to drip away. A patty of the 80/20 stuff, even if you just prepare it by broiling it instead of grilling it, is roughly as healthy as the meat on a McDonald’s double cheeseburger. I ended up buying the American slices for $1.89 for 16 slices, which you can check the nutrition facts on here. 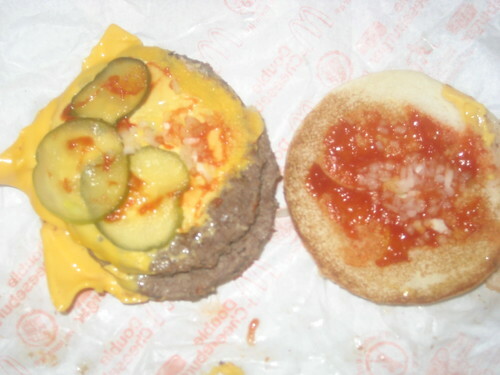 If you tack the cheese onto the meat, you start to approach the nutritional levels of the McDonald’s double cheeseburger, but this again assumes that you broil the meat instead of grilling it (grilling it is far better for you). 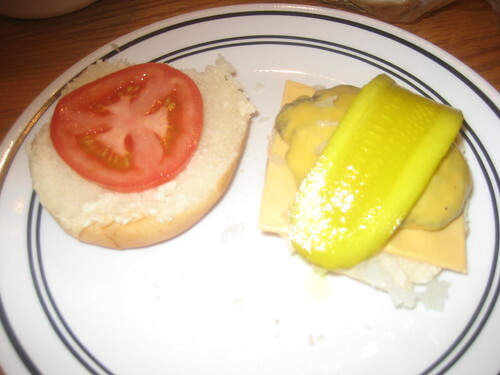 I then picked up a jar of pickles for $2.49, a package of hamburger buns for $1.99 (this was overpriced), an onion for about $0.40, and a tomato for about $0.40. 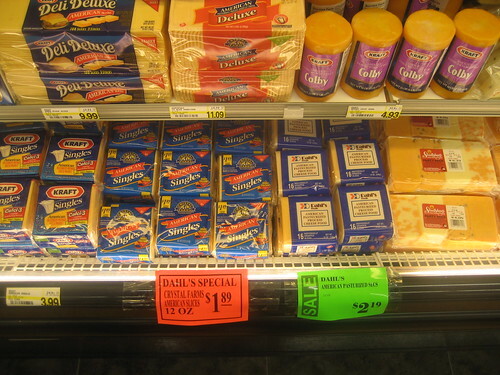 These ingredients are all very healthy, so I won’t reiterate the nutrition facts on these items – the “bad” ingredients are the cheese and the meat. I can assemble five double cheeseburgers from this material. Let’s get started on the cooking. I’ll allow you to draw your own conclusions. 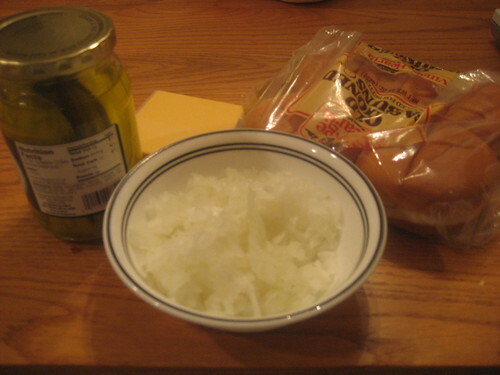 That’s six slices of cheese, most of a diced onion, almost all of a jar of pickles (which will last for a long time), and three buns. I have almost all of the ingredients for more sandwiches with the cost already covered! That’s a total of sixteen minutes for the homemade cheeseburger. How about the McDonald’s version? It took me eleven minutes for the burger I bought, so if I went there twice for cheeseburgers for two meals, that’s a total of twenty two minutes for McDonald’s. That’s right, it was more time-effective to make the homemade cheeseburgers and enjoy them again later than it was to go to McDonald’s twice and pick up the double cheeseburgers. What about the cost? The burger I assembled above cost $1.83, while the McDonald’s double cheeseburger was $1.06. However, there are a few factors that aren’t considered in those numbers. First, the homemade burger was healthier. It was grilled, and thus much of the fat dripped out of it. 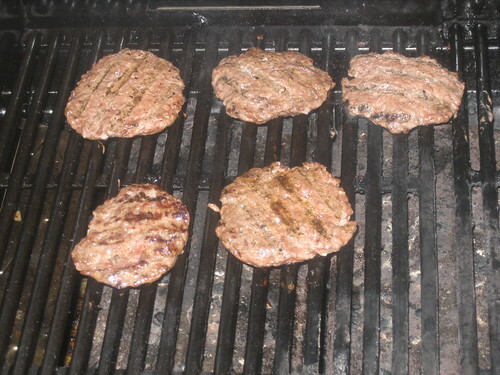 The nutrition facts numbers above consider only a broiled burger, not a grilled one. Second, the homemade burger had leftovers. 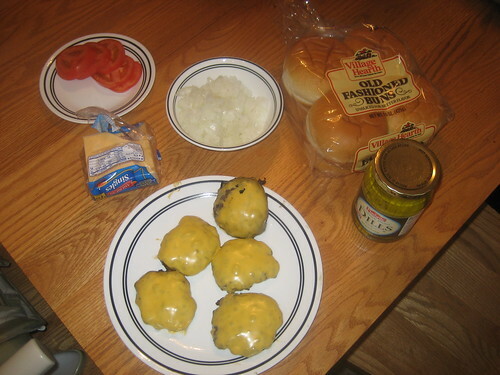 That cost per burger assumed no leftovers, but I had most of a diced onion, almost all of a jar of pickles, six slices of cheese, and three hamburger buns left over. Without much more, I can make another meal out of these ingredients – just give me some cold cuts, for instance. Third, the homemade burger had many more options. I can do whatever I want with my homemade burger in terms of options – for example, I made the audible switching the ketchup for a tomato slice. Lastly, the homemade burger was far, far tastier (at least for me). I tasted them side by side and it wasn’t even close. Of course, this really is a matter of opinion. For me, these factors make the homemade cheeseburger blow away the McDonald’s double cheeseburger. I might spend pennies more on the homemade cheeseburger when all the costs are considered, but the healthiness, the flavor, the configurability, and the surprising time efficiency makes the homemade cheeseburger. 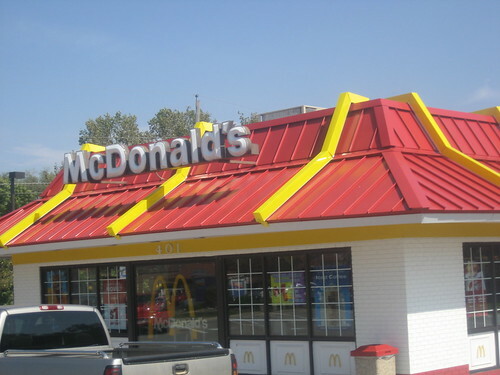 What do you think of McDonald’s? Basically, I’m indifferent. I think fast food restaurants fill a role and have some big benefits (convenience, mostly), but it is my belief that the other factors that are negatives towards fast food should usually swing things back towards preparing food at home. The take home point? Don’t eat fast food because you believe it to be “cheap.” The only real advantage of fast food is convenience – in the end, it has almost nothing to do with money. In fact, if you choose anything but the absolute best value on the menu – which the McDonald’s double cheeseburger might be – it’s going to be far more expensive to eat fast food than eat at home.